Because it could save your life. 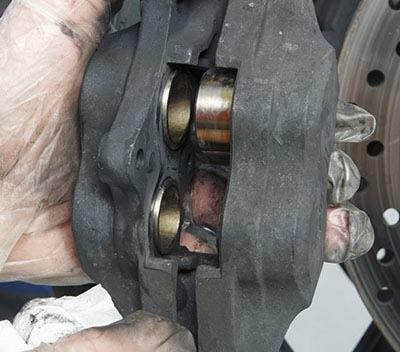 Most routine services don’t include cleaning and servicing the calipers unless the brake pads need changing or there happens to be a problem with them such as a partially sticking piston, or worse, a totally seized one. It pays to look after not only the shiny bits the eye can see, but also the not-so-shiny bits you can’t. A very simple piece of hydraulic equipment. Other than the obvious concerns over safety, provided you’ve got a decent tool kit and at least a modicum of common sense you should be more than equipped for the job. A paddock stand is handy but not actually essential, a decent socket set (8-19mm minimum), a torque wrench, a slotted screwdriver, a set of combination spanners (8-19mm), a good quality set of Allen keys (4-10mm), a tin of brake cleaner, a tin of WD-40 or other penetrating oil, a washing-up bowl, some fine-grade 800 grit and 1500 grit ‘wet-or-dry’ emery paper, and a pair of water-pump pliers. A pair of latex gloves are going to come in handy, too. Like any job, if it’s rushed it can go horribly wrong. Just take time to remember what goes where (a digital camera or even a camera-phone can prove invaluable for taking memory-jogging snaps). 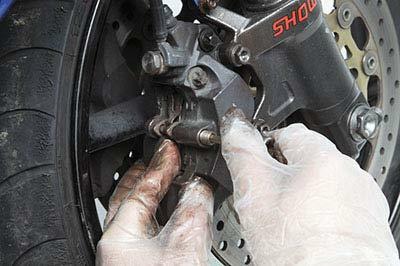 A basic understanding of how a brake caliper works is a good start. The biggest skill we all need for safe home spannering is patience. 1. 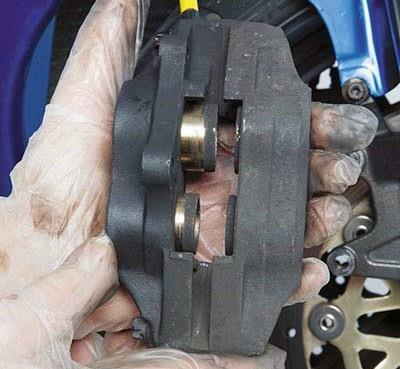 Gently squeeze the brake pads against the pistons (eg away from the disc) by gripping them with the water- pump pliers against the caliper then remove the retaining pin(s) that are holding the pads in place. 2. 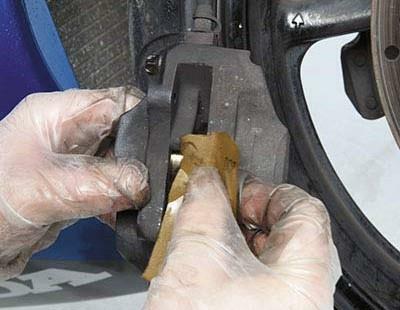 Be careful as you withdraw the pin(s) that the spring-loaded ‘anti-rattle’ shim doesn’t fly off into the deepest, darkest corner of your garage. Use a parts tray or an old baking tin to store small parts and to catch dust and cleaning agent from the caliper. 3. 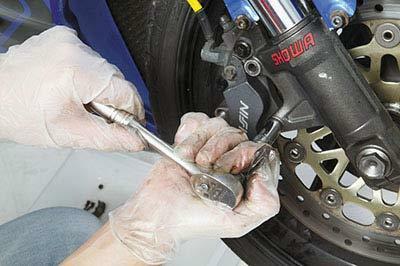 Undo the caliper retaining bolts. On a conventional caliper they thread into the fork leg from the side of the caliper. Radial calipers mount through the back of the caliper. Lift the caliper clear of the disc being careful not to damage the mudguard (you could put an old T-shirt between the caliper and the wheel to prevent possible damage). 4. 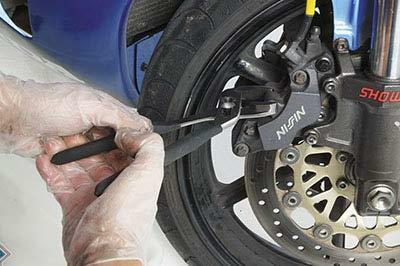 Inspect the caliper for obvious signs of damage. 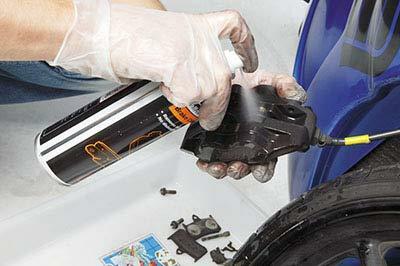 Spray brake cleaner directly at the pistons and agitate any stubborn dirt with an old toothbrush or washing-up brush. Do not use a wire brush – you can quite easily score the pistons and damage the seals if you are careless. 5. Gently pump the brake lever (without pulling it right back to the bar) while watching the action of the pistons. They should come out then return very slightly. If they don’t return, or you can’t push them back, the piston may be partially seized. Don’t panic, in 99% of cases, we can deal with this easily. 6. Clean the pistons with very fine wet-or-dry paper and WD-40. You can use 1200 grit, but 1500 grit is better (though harder to find). Unless your bike is brand new, there will be a coating of corrosion at the edge of the piston where it is exposed to brake dust and, in winter, road salt. 7. Make sure you clean around the whole outer surface of each piston by rotating the piston if necessary then easing the piston back in. 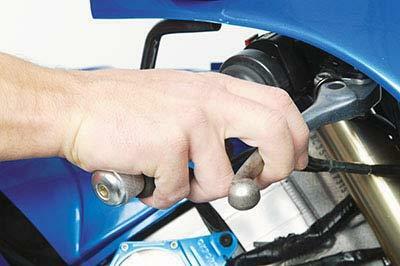 If it is too stiff to do by hand, gently use the water-pump pliers to push the piston back in. Work on one piston at a time until it returns easily. Repeat until totally free. 8. With the caliper now cleaner than it’s been for years, refit it to the fork leg. Apply a little copper grease to the bolt threads, do them up finger-tight, then fully tighten to the manufacturer’s recommended torque setting using a torque wrench. Now it’s time to inspect the brake pads in more detail. 9. 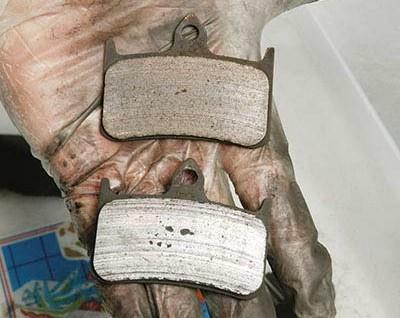 Now we know the caliper is working to its full potential, let’s take a closer look at those pads. There is plenty of friction material left on them, but are they glazed? If the surface of the pad looks shiny, gently rub it with some clean, dry 800 grit emery paper (don’t whatever you do use oil this time) to take off the ‘sheen’ or ‘glaze’. 10. 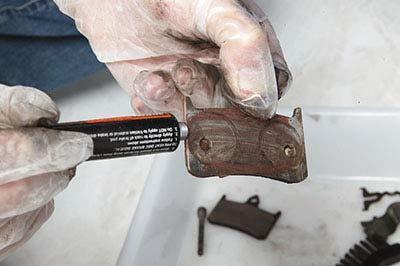 Clean the retaining pins, the backs and – just as importantly – the sides of the pads. 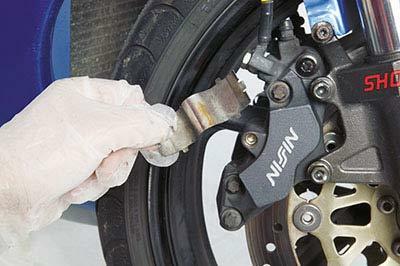 The caliper should be clean already, but it won’t hurt to give the pad ‘seats’ a wipe. Apply a little copper grease to the pins and the back of the pads – just don’t go mad with it – you don’t want it ending up on the pads' friction material or on the brake discs. 11. Reassemble the pads, pin(s) and anti-rattle shim(s) making sure it all goes back in the exact reverse order of dismantling. If you don’t have a workshop manual, refer to the pics you took with your camera/phone if you’re unsure of anything. You did take some pics, didn’t you? 12. 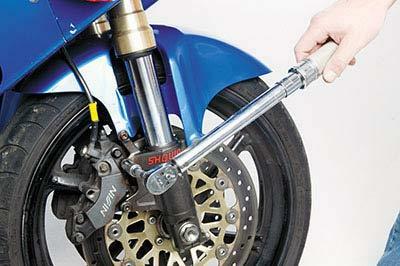 Gently pump the brake lever to pressurise the braking circuit and to return the pads to their original position. On the road treat the brakes as if they are new and allow them to bed in for a good few miles. Marvel at how much better your brakes are, ‘accidentally’ pull a big stoppie and buy yourself a beer. You’ve just saved at least a hundred quid.